Physicists at the University of Vienna and the Austrian Academy of Sciences have achieved quantum teleportation over a record distance of 143 km. 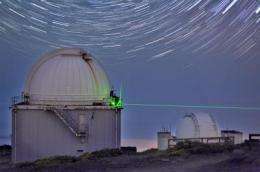 The experiment is a major step towards satellite-based quantum communication. The results have now been published in Nature. 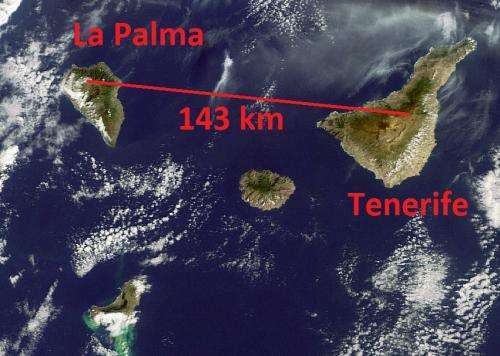 An international team led by the Austrian physicist Anton Zeilinger has successfully transmitted quantum states between the two Canary Islands of La Palma and Tenerife, over a distance of 143 km. The previous record, set by researchers in China just a few months ago, was 97 km. Breaking the distance record wasn't the scientists' primary goal though. This experiment provides the basis for a worldwide information network, in which quantum mechanical effects enable the exchange of messages with greater security, and allow certain calculations to be performed more efficiently than with conventional technologies. In such a future 'quantum internet', quantum teleportation will be a key protocol for the transmission of information between quantum computers. In a quantum teleportation experiment, quantum states—but not matter—are exchanged between two parties over distances that can be, in principle, arbitrarily long. The process works even if the location of the recipient is not known. Such an exchange can be used either for the transmission of messages, or as an operation in future quantum computers. In these applications the photons that encode the quantum states have to be transported reliably over long distances without compromising the fragile quantum state. The experiment of the Austrian physicists, in which they have now set up a quantum connection suitable for quantum teleportation over distances of more than 100 km, opens up new horizons. Xiao-song Ma, one of the scientists involved in the experiment, says: "The realization of quantum teleportation over a distance of 143 km has been a huge technological challenge." The photons had to be sent directly through the turbulent atmosphere between the two islands. The use of optical fibres is not suitable for teleportation experiments over such great distances, as signal loss would be too severe. To reach their goal, the scientists had to implement a series of technical innovations. Support came from a theory group at the Max Planck Institute for Quantum Optics in Garching (Germany) and an experimental group at the University of Waterloo (Canada). Ma also said "An important step for our successful teleportation was a method known as 'active feed-forward', which we have used for the first time in a long-distance experiment. It helped us to double the transfer rate". In an active feed-forward protocol, conventional data is sent alongside the quantum information, enabling the recipient to decipher the transferred signal with a higher efficiency. "Our experiment shows how mature 'quantum technologies' are today, and how useful they can be for practical applications," says Anton Zeilinger. "The next step is satellite-based quantum teleportation, which should enable quantum communication on a global scale. We have now taken a major step in this direction and will use our know-how in an international cooperation, which involves our colleagues at the Chinese Academy of Sciences. The goal is to launch a 'quantum satellite mission'." Rupert Ursin, who has been working with Zeilinger on long-distance experiments since 2002, adds: "Our latest results are very encouraging with a view to future experiments in which we either exchange signals between Earth and satellites or send messages from one satellite to another." Satellites in 'low-Earth orbit' fly between 200 and 1200 km above the surface of the Earth. (The International Space Station, for example, orbits at an altitude of about 400 km.) "On the way through the atmosphere from La Palma to Tenerife, our signals have been attenuated by a factor of roughly one thousand. Nevertheless, we managed to perform a quantum teleportation experiment. In satellite-based experiments, the distances to be travelled are longer, but the signal will have to pass through less atmosphere. We have now created a sound basis for such experiments." More information: Xiao-Song Ma, Thomas Herbst, Thomas Scheidl, Daqing Wang, Sebastian Kropatschek, William Naylor, Bernhard Wittmann, Alexandra Mech, Johannes Kofler, Elena Anisimova, Vadim Makarov, Thomas Jennewein, Rupert Ursin & Anton Zeilinger. Quantum teleportation over 143 kilometres using active feed-forward. In: Nature (Advance Online Publication). DOI:10.1038/nature11472 (2012). Indeed! I was curious about that quantum brake, until I realize they just break a record. Failed attempt to sensationalize headline. Physorg usual unfortunately. Headline fail! Most will put up with a typo in the text. Mistakes on headlines, however, look ignorant and stupid. I thought you couldn't transmit information via entanglement? So what are they "teleporting"? Also, they said they sent the photons "over the air"... so I assume they need line of sight from transmitter to reciever... at 143km what is the apparent elevation change due to the curvature of the Earth? Did they have to build a tall tower for one or the other (or both if bidirectional)? @Deathclock You can't send information purely by using entanglement. But by using an old-fashioned standard communication channel *combined with* entanglement you can send more information than you can send by a standard communication channel alone. In particular you can send information about the quantum state of something. This is useful for any kind of communication protocol when you need to send quantum states, such as quantum key distribution. You can indeed transmit the information via entanglement, with superluminal speed in addition. This information just cannot be fully deterministic - which makes no serious problem in many practical applications. We could compare it to spreading sound waves across water surface or to spreading of gossip through human society - it usually surpasses the official media channels, but its of indeterministic nature, without defined source-target path and non-reliable. It's typical for superluminal information transfer, the spreading of information cannot be tracked along whole its path: the information carrier disappears at some place while it emerges somewhere else, so it doesn't contradict the special relativity in its strict sense. The special relativity doesn't prohibit the quantum jumps. The idea is to enable communication with distant objects on a real-time basis regardless of distance, like from here to the moon or Mars. I foresee now that this is not a long way off. I don't think that's the idea at all... every credible source I read regarding entanglement the author goes out of their way to explain that it cannot be used to send information FTL. The physicists Günter Nimtz and Alfons Stahlhofen, of the University of Cologne, claim to have violated relativity experimentally by transmitting photons faster than the speed of light. They have conducted an experiment in which microwave photons—relatively low energy packets of light—travelled "instantaneously" between a pair of prisms that had been moved up to 3 ft (1 m) apart. Their experiment involved evanescent waves, and since evanescent modes have an imaginary wave number, they represent a "mathematical analogy" to quantum tunneling. I didn't expect work on the ansible to start this soon. But there is allot of hype about this these days, being able to do amazing things using entanglement. That's the thing that bothers me in the title(OOOH, teleportation?!!!). It's the sort of article that is titled to get some attention from more mainstream news sources. But you know, as poorly as it is explained, incomprehensible to the average reader of, say, The Wall Street Journal, it's the kind of thing that just might get picked up, and inspire some greedy person out there to actually learn more about the subject. It's good in one way and just terribly troubling in another. As an easy to follow analogy of space between prisms in Nimtz experiments may serve a board floating at the surface of elastic fluid, like the water in large basin. The surface ripples cannot penetrate the board, but because water is elastic, the subtle portion of their energy can propagate beneath the board trough the hidden dimensions of underwater. Note that we lose the information of about location of source of waves at the other side of board, because this portion of information is mediated via longitudinal waves, which follow they Huygens principle (every point of undulating environment becomes a source of new wave). I think that depends on who you are and when you are, to use the best common description I can think of. I think these things might well appear easier to follow for future generations than they are for even the best of us now. Well, it's just my opinion. I work in fiber optics, the typical attenuation for conventional single mode fiber at 1310nm is about 0.33 dB/Km. Absorption makes up only a small amount of that loss, the majority of it is due to diffuse scattering. I could write a page long rant about how some of todays interpretations of QM fare in comparison to those of the Holy Bible, but that would be just another exercise in futility.. Instead I note that the "entanglement" was achieved by classical transmission of a photon (travelling at the speed of light through air) between point A (La Palma) and B (Tenerife). The photon was used to synchronize ("teleport") the quantum state of a qubit at point A, with a qubit at point B. Did they have to build a tall tower for one or the other (or both if bidirectional)? By using quantum teleportation, unknown quantum states can be transferred over arbitrary distances to a party whose location is unknown. But the holy textbooks say that there is "spooky instanteous action" - you just have to close your eyes and believe, or it won't work! So it must be true.. No? Delayed measurement, gentlemen.. Delayed measurement..
"The next step is satellite-based quantum teleportation, which should enable quantum communication on a global scale. We have now taken a major step in this direction and will use our know-how in an international cooperation, which involves our colleagues at the Chinese Academy of Sciences. The goal is to launch a 'quantum satellite mission'." This is massive. If they can do this wirelessly then the day isn't far when we can communicate with satellites leaving the solar system almost instantaneously using quantum communications. One very important measurement you can make from a satellite 1/10 of a light second away , is whether quantum transfer happens at the speed of light , or is it instantaneous ..
"Entanglement" is replaced by "teleportation" while physical principle is basically the same. The 2nd link makes it quite clear that: "Quantum teleportation is unrelated to the common term teleportation – it does not transport the system itself, and does not concern rearranging particles to copy the form of an object." and ". It is useful for quantum information processing. However, it does not immediately transmit classical information, and therefore cannot be used for communication at superluminal (faster than light) speed." One day you'll eat those words. It's typical for superluminal information transfer, the spreading of information cannot be tracked along whole its path: the information carrier disappears at some place while it emerges somewhere else, so it doesn't contradict the special relativity in its strict sense. The special relativity doesn't prohibit the quantum jumps. Or could scalar waves be an information carrying vehicle? They are unaffected by the Lorentz transformation, and behave the same in all inertial frames of reference. IMO scalar waves are actually gravitational waves - i.e. the longitudinal waves of the vacuum. They even exhibit their own solitons in similar way, like the light waves generate solitons called the photons. I presume, the solitons of scalar waves are well known neutrinos. Whereas the photons are slightly slower than the light waves, the neutrinos should be slightly faster, at least so called sterile neutrinos without charge, which weren't proven yet. Ma also said "An important step for our successful teleportation was a method known as 'active feed-forward', which we have used for the first time in a long-distance experiment. It helped us to double the transfer rate". In an active feed-forward protocol, conventional data is sent alongside the quantum information, enabling the recipient to decipher the transferred signal with a higher efficiency. Okay, so if I am interpreting this correctly; there really wasn't any improvement at all being that the whole point of this in the first place is to send the quantum information across vast distances WITHOUT the conventional data. So now we have this new method we call "active feed-forward protocol" which only receives the data further "more efficiently" because we sent it with the conventional data we were trying to get away from sending in the first place. IMO scalar waves are actually gravitational waves - i.e. the longitudinal waves of the vacuum. "The difference between the new field equations and Einstein's equations is the addition of a second-order covariant derivative of a scalar potential field," he said. "Gravity theory is fundamentally changed and is now described by the metric of the curved spacetime, the new scalar potential field and their interactions." Can anyone explain how information could be sent using entanglement? If the difference in both entangled particles (photons whatever) is unknown until one is intercepted and read how could any information be ascertained from either one?